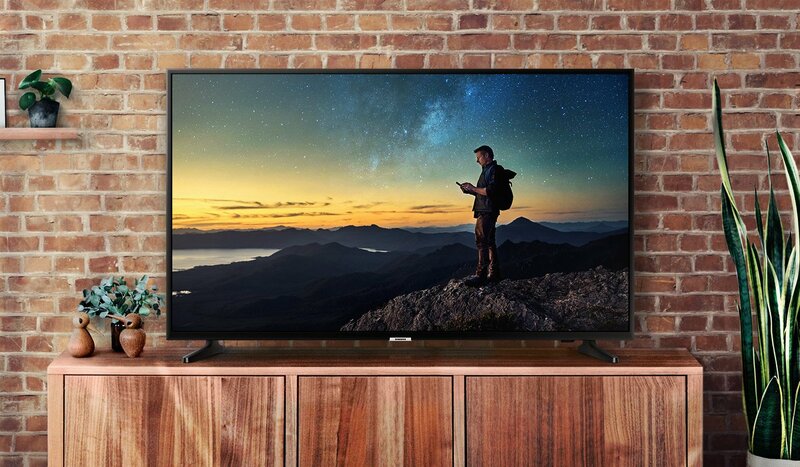 With the clarity of the NU6900 43" 4K Ultra HD TV from RC Willey, you get a step up from full HD. You will enjoy 4X the resolution of full HD, plus non-4K TV content is upscaled to 4K via a powerful UHD engine. With PurColor™ you will enjoy millions of shades of color, fine tuned to create an incredibly vibrant picture. And, with Samsung's HDR, you will have a stunning range content including the latest HDR10+ that adjusts picture quality scene by scene. This TV is a clear upgrade for your home. Dimensions With Stand (W x H x D) 38.1" x 23.8" x 8.1"
Dimensions Without Stand (W x H x D) 38.1" x 22.5" x 3.1"
43 Inch Samsung NU6900 4K Ultra HD Smart TV is rated 2.9 out of 5 by 29. Rated 4 out of 5 by skinhouse Great Picture Needed a tv for bedroom when I use our treadmill.This tv has everything plus good color. Rated 2 out of 5 by GloRida Won’t play anything on amazon prime I’ve had this TV for several months and it seems great until I try to stream from Amazon prime, which only works about 10% of the time. I’ve spoken to my service provider, done speed tests and other services stream fine but I get an error on prime that says my bandwidth is insufficient. Boo. Lame. Seems to likely be an issue with sansung’s Prime app, since it works on my other tv, fire stick, laptop and phone. Tech support with my ISP said that they’ve heard this complaint from other people with Samsung TVs. Rated 5 out of 5 by Charles S Great TV Was very easy to set up. Picture are perfect. Would buy again if needed. Rated 3 out of 5 by quicknova Great TV for the price so far I bought the TV to replace an older dual core model as waiting for the "TV to be prepared" was extremely annoying. This one comes up much faster and the picture is very nice. One issue I have is that I have an older dish that has the primary out as HDMI but a secondary unit only puts out coax which is what I was trying to connect this TV to.. this TV absolutely will not recognize the coax input from the dish to it so I can't view any of my programs on it. I can't find anywhere in the specs or manual that said it wouldn't be able to. The only thing I can find is that ANY device must be plugged into an HDMI port with the exception of the coax antennae (which the dish is). Also even choosing the exterior speakers, it would not recognize the ARC HDMI port and I was forced to use an Optical audio cable even though my HDMI is rated for it. I also despise that every time you exit an app it pops up another application for you to rent movies/shows instead of you just being able to choose what you want to display. Rated 2 out of 5 by Potato85 Issues! I received this TV 7 days ago and the picture randomly bounces to the left multiple times every few minutes. Turning the TV off for a minute temporarily resolves it, but the problems returns. After doing a power cycle, taking the cable TV off a splitter, and resetting the TV to factory, the problem persists. My last Samsung TV which I have had for 5 years never did this and it was using the same cable connection. I swore I would never buy anything except Samsung, but I don't have much choice but try a different brand. Rated 4 out of 5 by Cleo78 Unsatisfied with the design of the remote control The TV is great but I had another model with the remote control very well designed, simple, elegant and I was expecting the same for this model. I was disappointed when I found an old dated remote control. Rated 1 out of 5 by Dsakalas Awful! 2.4ghz streaming TV that doesn't stream! Just spend the extra $50! Don't buy this one. We've purchased so many Samsung products and have been loyal to the brand. This is the worst electronics purchase we've ever made. Bought in November 2018 and the TV does not recognize 5g internet. It handles 2.4ghz and doesn't stream our TV apps. Rated 3 out of 5 by Sweetsister Short on apps This was a gift from my husband for the bedroom for when I’m sick. It’s a great size. But it doesn’t have some of the apps that I like to watch. Rated 3 out of 5 by Grant B Decent Picute, but Lies in the description I bought this tv about 4 months ago, and it is pretty great. I am using it as a monitor from about 2 feet away, and the quality is great. The only thing I do not like about it was I thought that it was a 120 Hz tv because of its advertising as a "motion rate 120" tv. It is not, and is capped at 60 Hz. Rated 5 out of 5 by Dave P K Great features It's everything and more that I expected from the Samsung product. Very easy to set up and navigate all it's features. Rated 1 out of 5 by subira Do NOT buy! If you are looking for a SMART TV that you can use WITHOUT a firestick, roku, etc. this is NOT IT!!! Almost EVERY app I've tried to use (Directv Now, Hulu, etc.) has the OLD APP / SOFTWARE and CANNOT be updated!!! I would definitely return this TV if I could. DO NOT BUY!!! Rated 3 out of 5 by NewOwner11 Wish I'd done more research This TV is unfortunately not compatible with many of the products & services we bought shortly after purchasing the TV. Hulu Live TV, for example, is not supported on this device. Bluetooth headphones cannot be hooked up to the device. There are only two HDMI ports, so the Apple TV (which we still need for Airplay), cable, and sound bar cannot all be connected at the same time. Picture quality is okay, sound quality is quite bad, but is remedied with a our soundbar (not a Samsung). It's not a terrible TV, but I do wish we'd had to foresight to anticipate these needs before we purchased. Rated 1 out of 5 by ssookraj Screen stopped working Within a month of purchase the screen stopped working. The sound works but the screen remains blank. There is no physical damage to the tv. The wifi connectivity is also terrible and slow. Rated 1 out of 5 by Crissy39 SOOOO DISAPPOINTED!! I bought this tv 43" Class NU6900 Smart 4K UHD TV (2018) 11 DAYS AGO and the button just flashes red and doesn't turn on. It has been a problem since I got it, the picture kept going black ( thinking it was my cable) I would power cycle it and it would work for a bit on the 11th day it just turned off and never came back on mind you this is on Dec 23rd so I have no tv for the holidays. Rated 3 out of 5 by sadmen Good TV misleading specs The tv says it has 120 motion rate which I assumed to mean that it was 120hz but this is wrong the tv is only 60hz. Rated 5 out of 5 by lxJGTxl Great TV Not quite sure why anyone would review this TV poorly. Bought this TV to replace my old bedroom TV. The picture looks great, colors are vibrant, motion is clear. I've had no issues navigating around though YouTube and Netflix using the smart features. Playing my xbox has been a nice experience too. For the price of this TV, you definitely get a great value for what you get. Rated 4 out of 5 by Nateyvo815 Quality under $300 I bought this TV a week ago and I must say, after playing my PlayStation 4 pro, and watching football on it with a 4K antenna, that this TV is good. Good is the best word to explain this TV as it won’t amaze anyone with features, viewing angles, colors, brightness, and sharpness. But it’s not bad either. No input lag for us 4K gamers and the picture image is very high quality. Would recommend this TV if your budget is less then $300. Rated 2 out of 5 by TVShopper2018 Slow UI, Forced "Sponsored Content" Purchased two of these TVs today and the first thing I noticed was the laggy UI. The other thing that really bothers me is that there is a "Sponsered Content" on the main app menu. If I pay for a TV, I expect to be able to remove this, which you can not. Will return TVs tomorrow and purchase LG instead. Rated 2 out of 5 by Papaya9 Great Picture, Poor Sound Quality The sound quality is poor. My 9 yr old 40 inch Samsung TV that we replaced had excellent built in speakers. However, this new Samsung TV cannot even compare. I played with the different sound modes and was still disappointed. If I had heard the TV in the store, I would not have made the purchase because I expect better sound quality from a Samsung. There were many cheaper options but I bought Samsung because I expected a great TV. These expectations were not met. On the plus side, the image is far superior to my prior TV and gaming looks great. It is also lighter then my old Samsung TV and looks sleek. Rated 5 out of 5 by Javier C THIS TV IS AWSOME. Everything is good about this tv, it runs really smooth, the graphics are amazing, and the audio is amazing just one cache. If you're a person who loves blasting music or anything that has audio this television cant reach super high volumes even at 100 volume and thats why the sound bar is available. Nice job Samsung. Anyways this TV is amazing and recommend it to everyone. Rated 3 out of 5 by ChuckTom Samsung is getting cheap Overall, I think this TV is great piece of hardware. However, Samsung is getting cheap by removing the Bluetooth compatibility on this cheaper model. I mean really? Come on Samsung you can do better. If you need bluetooth to be able to watch with headphones with ease then stay clear of this model! I would trade the wifi & smart tv apps all for Bluetooth. Rated 3 out of 5 by John McCall Nice entry level TV, many features Nice entry level TV. Pros: many build-in features - wifi, HDMIARC, menus with links to streaming channels. Con: too many menus, guides, etc. No composite video in, poor speaker sound quality, cheap stand. Sometimes you get what you pay for - in this case, nice picture and builtin features but poor sound quality and plastic stand.. Rated 5 out of 5 by Gerry T I don't know what everybody is complaining about. This is a fine, fine TV. Great picture, excellent design, menus are beautiful and easy to navigate. I primarily use this for watching sports and movies, and this set is just fine for that. I don't watch Hulu, and I don't even know what Spectrum is. I just know that, for what I watch, this set does the job. I'm glad I got it. If I had one gripe, it would be only 2 HDMI ports. Three would be nice, along with RCA inputs/outputs for my old VCR, but I've figured out workarounds for that. Rated 3 out of 5 by BobVe Nice picture ... but The picture is great, but I am not too happy with the number of input ports. Only 2 HDMI and a USB. No A/V input. Needed to buy adapters to expand to connect more devices.